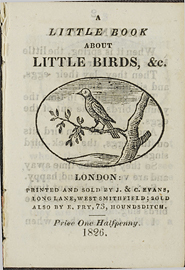 A little book about little birds. London : Printed and sold by J. & C. Evans, Long Lane, West Smithfield, 1826. Printed and sold by J. & C. Evans, Long Lane, West Smithfield, 1826. First sentence: "When it is spring, the little birds build their nests." Copy in McGill Library's Rare Books and Special Collections: black & white cuts. Vignette on front wrapper; illustration on back wrapper. I. Mackenzie. Montreal. Dec/70. $10.00. text.chapbook.black and white, 85 x 58 mm.